There couldn’t be a better time for Stewart-Haas Racing (SHR) to scratch off winning at Talladega (Ala.) Superspeedway from its to-do list than Sunday at the Monster Energy NASCAR Cup Series 1000Bulbs.com 500 – the second of three Round of 12 races in the Cup Series playoffs . The Kannapolis, North-Carolina-based team co-owned by Tony Stewart and Gene Haas and has recorded 49 victories and 42 poles since its inception in 2009. It’s celebrating its 10th anniversary season by turning in its best season-long performance to date. SHR’s Fords have won 10 of 30 Cup Series points races in 2018, plus the non-points NASCAR All-Star Race. All four SHR drivers qualified for the playoffs and advanced to the Round of 12. Despite SHR’s race wins, two championships and a dominant season in 2018, there’s still one item left that has eluded the organization – victory at Talladega. SHR owns four top-five finishes and 17 top-10s in 58 starts at the 2.66-mile superspeedway, making it and Kentucky Speedway in Sparta the only two active Cup Series tracks where SHR has not earned a victory. That could change Sunday, and Clint Bowyer, driver of the No. 14 Cummins/Rush Truck Centers Ford Fusion, hopes he’s the driver to do it. Bowyer needs the victory because he arrives at Talladega after what appeared to be a top-five run at Dover (Del.) International Speedway Sunday in the first of three Round of 12 races turned into a 35th-place finish after mechanical issues and an accident ended his race early. The finish dropped him to 10th in points and 10 points behind the eighth and final transfer spot with two races remaining in the round. Bowyer knows that for him or SHR teammates Kevin Harvick, Kurt Busch or Aric Almirola to win at Talladega, a lot of things will have to go right. His Talladega race in April ended with 22 laps remaining when he was collected in a multicar accident while running 12th. New SHR partner Cummins makes its first appearance as the primary paint scheme on the No. 14 Ford Fusion Sunday. The Columbus, Indiana-based company is no stranger to victory lane with its racing lineage dating back to the inaugural Indianapolis 500 in 1911, when company founder Clessie Cummins was on the pit crew of the race-winning Marmon Wasp of driver Ray Harroun. Since its founding in 1919, the company now employs approximately 58,600 people and serves customers in about 190 countries and territories through a network of some 500 company-owned and independent distributor locations and approximately 7,500 dealer locations. While Cummins is a corporation of complementary business segments that design, manufacture, distribute and service a broad portfolio of power solutions, it is best known for its diesel truck engines. At Talladega, Cummins will share space on the No. 14 with Rush Truck Centers, the nation’s largest provider of premium products and services for the commercial vehicle market, with the largest truck inventory in North America. 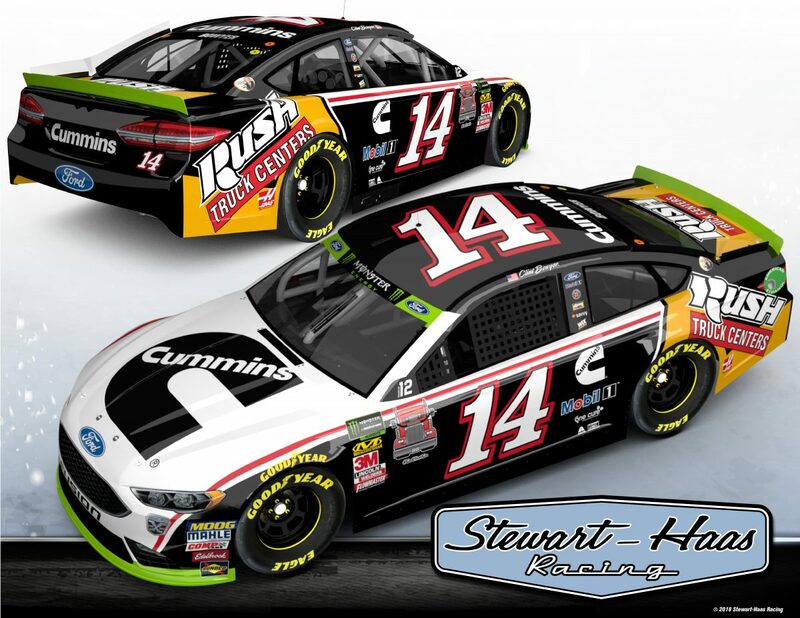 Rush Truck Centers has used Bowyer and the team to appeal to NASCAR fans as one way to recruit the technicians it needs to operate the largest network of commercial truck and bus dealerships in the country, with locations in 22 states. According to Rush Truck Centers, the trucking industry is expecting a need for 200,000 diesel technicians over the next 10 years to keep up with maintenance demands. Rush Truck Centers wants to make NASCAR fans aware of these opportunities. Bowyer would like to take SHR, Cummins and Rush Truck Centers to victory lane, but he’d really like to do it for himself and his No. 14 team. What is it like to be inside the car during a race at Talladega?